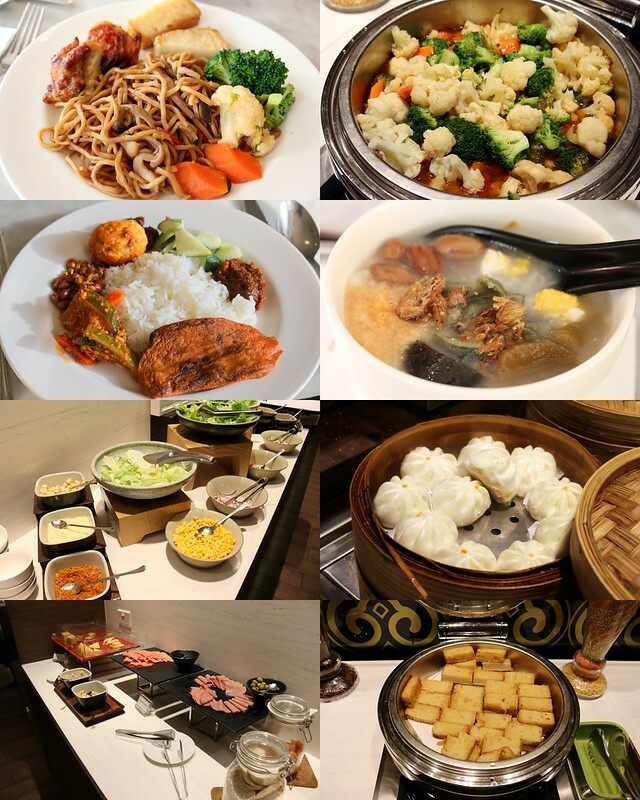 Have you been to the Village Hotel Katong (VHK)? The Far East Hospitality group has done a nice job completely refurbishing the old Paramount Hotel. Well, it is a S$30m facelift! 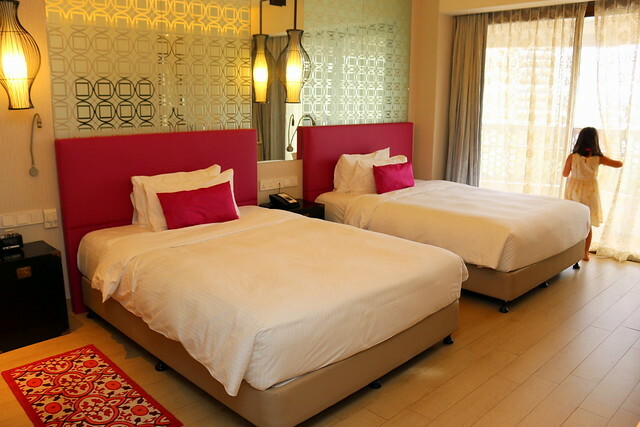 Launched Nov 2013, the cosy Peranakan-inspired hotel has 229 smoke-free rooms in the quaint Katong district. I love the bright colours and contemporary Asian motifs. Look how the glossy mirrored ceiling adds depth and height to the lobby. 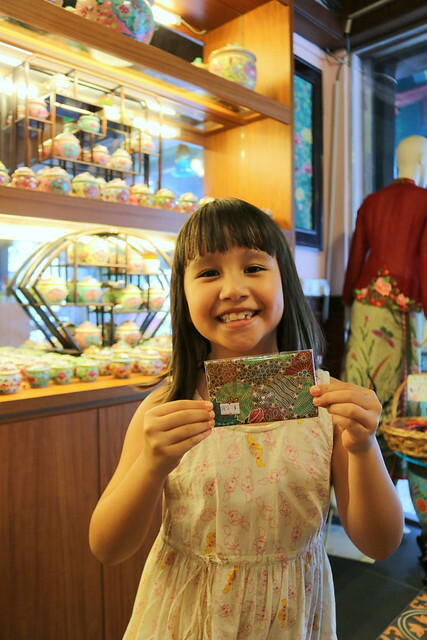 VHK recently introduced a pleasantly affordable holiday experience for local families (S$285++, Family room) and couples (S$195++, Deluxe room) interested in getting to know more about Peranakan culture. 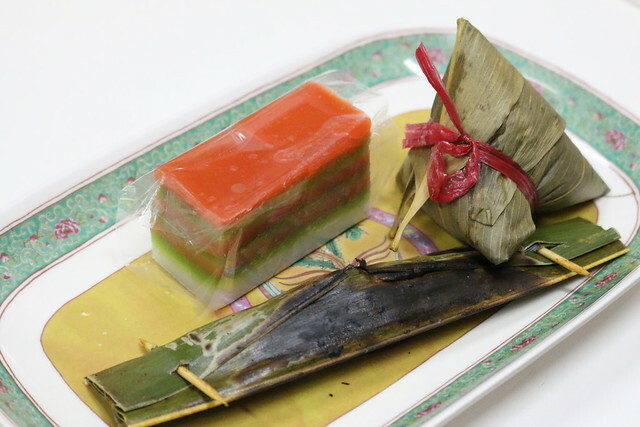 The Kim Choo session includes a rice dumpling wrapping demo, with a short sharing of the Peranakan culture/history and also a sampling of the Peranakan kuehs and snacks. 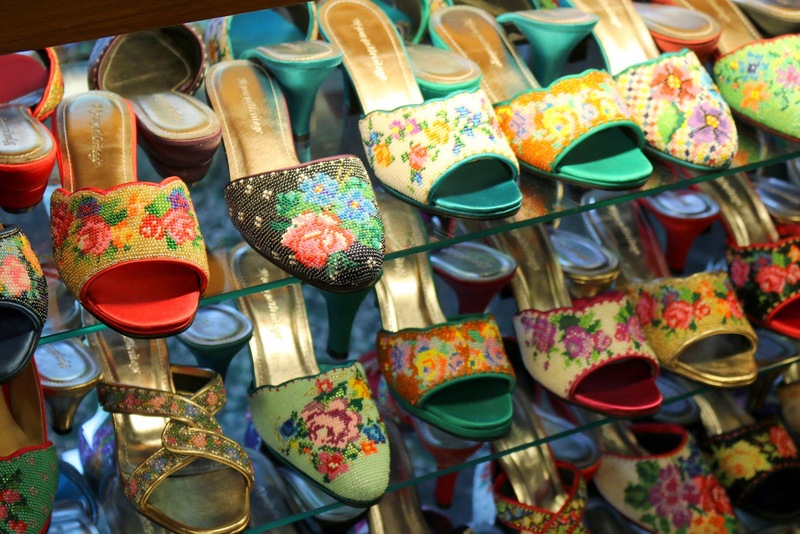 You might think you already know lots about Peranakan culture as a local, but trust me, they will regale you with so many interesting tidbits, you'll come away completely charmed. 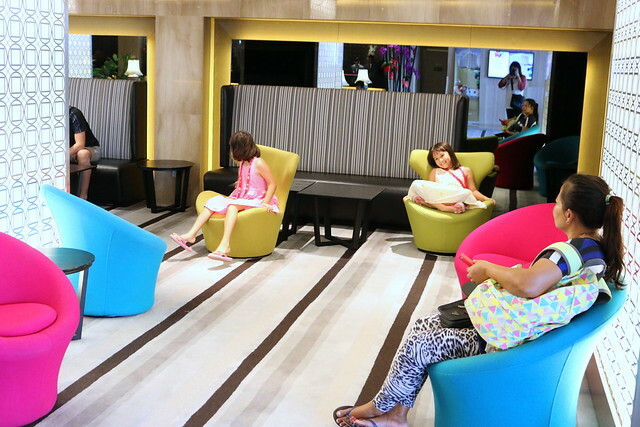 The lobby lounge is spacious with more private nooks at the side for reading or coffee. Or in this case, happy children discovering the swivel chairs. The kids loved this place immediately. This is the Family Room; it's much bigger than the others and fits two double beds. There's a small balcony too. Ours faced the East Coast Parkway scenery. Furnishings are kept simple and minimal, for a clean look. 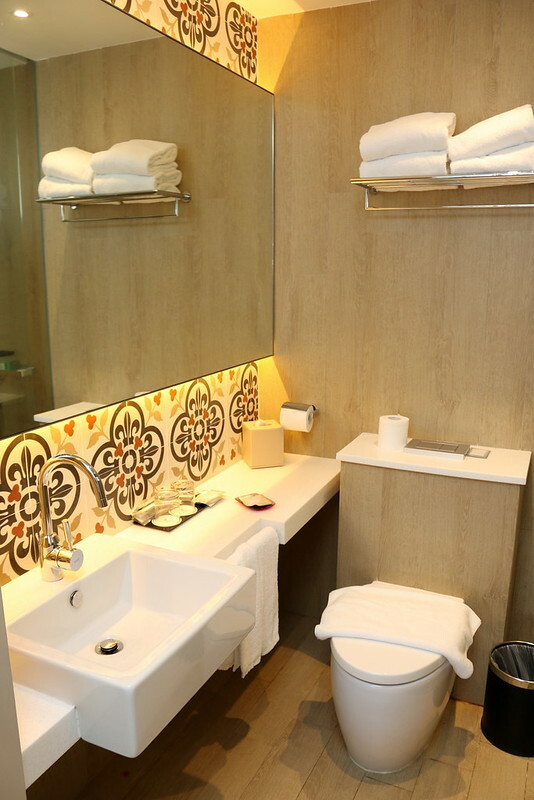 The beautiful Peranakan patterns extend to the bathroom in the bold decorative tiles. There's a rain shower but no bath tub as the space is fairly small. 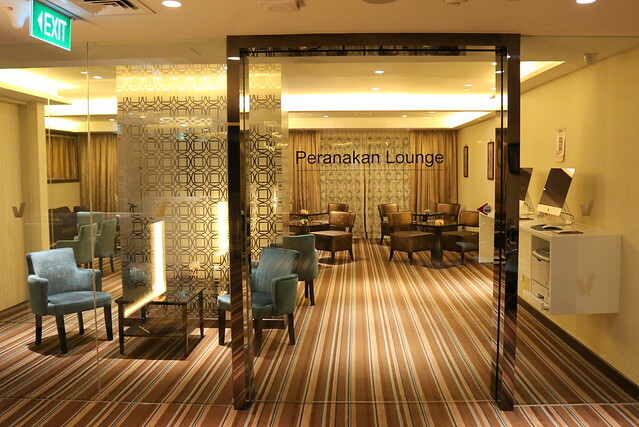 I've read that the Peranakan Club rooms have an in-room standalone tub which sounds awesome. But let's go to Kim Choo since it's at 3-5pm, soon after check-in. There are so many lovely things to look at. 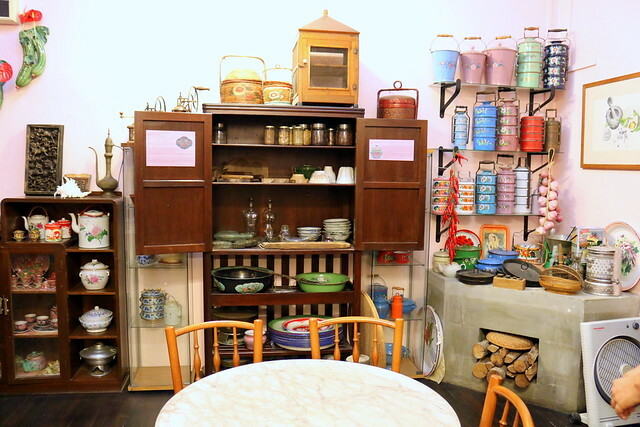 Upstairs in the Kim Choo shophouse, you'll see a treasure trove with museum-worthy pieces. The sideboards are intricately carved and decorated with ancestral pictures, Mother Mary paintings, peonies, phoenixes, bamboos. These are usually placed near the front door. There are also Victorian cabinets with Chinese carvings, and even Chinese lions as the feet. These used to be owned by the very rich who could afford delicately carved pieces. 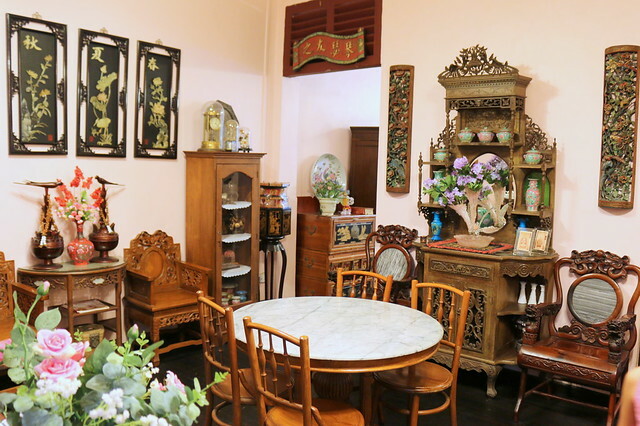 In the Peranakan home, the kitchen reigns as the soul of the house. Someone once told me if your Peranakan friend invites you over but never shows you the kitchen, they don't really like you. Interestingly, there's not much porcelain. Enamel ware - with origins from Europe - was much more popular even though it was more expensive. It doesn't spoil or break. There are tiffin carriers for the dad's or kids' lunches or potluck parties among friends. Again we see decorative peonies symbolising wealth and good fortune, while phoenixes represent wedding or couples' bliss. Two little "nonyas" for the day! Jolie and Nadine so loved dressing up in the traditional clothes. So many pretty things to look at. And that's Raymond (bottom left), the most knowledgeable host-owner of the shop. Ask him anything about the culture, and he will go into greater and more astonishing details! 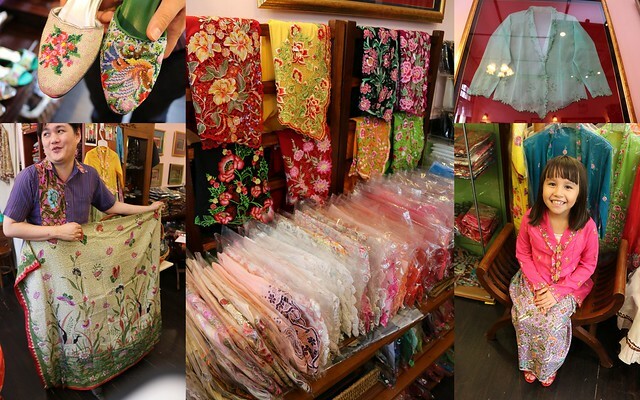 Did you know otah otah is Peranakan in origin? It likely came from Semarang (central Java), where a lot of Peranakans settled. Raymond says the Indonesian connection kind of explains why buah keluak (the black nut indigenous to Indonesia) and nasi ulam are mainstays of Peranakan cuisine. And I learned that love letters are called that because the lacy edges of the egg wafer when rolled up resemble grandparents' marriage certificates. How sweet! 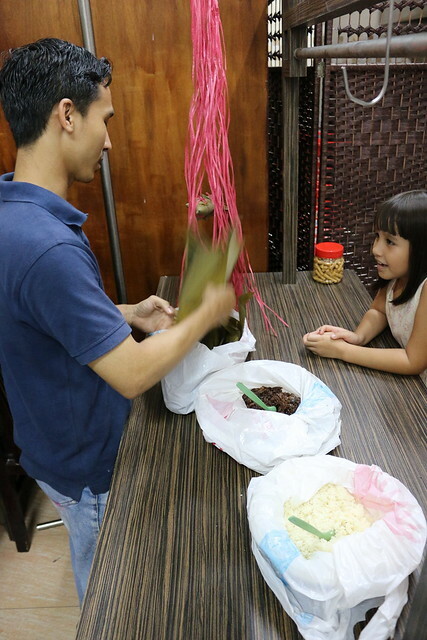 The rice dumpling wrapping demo is quite interesting if you've never seen it done before. 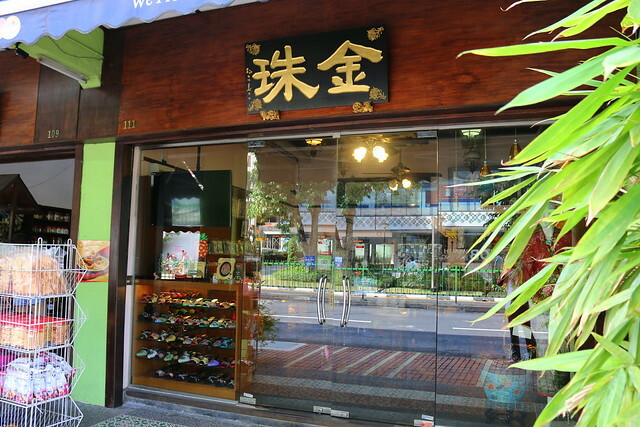 Kim Choo is just a 5-minute walk from VHK; it's on 111 East Coast Road. Highly recommended, and there are so many tasty snacks to buy too! Swimming next! Oh, the pool caught us by surprise - small and round but with one side unusually deep (like 2m although it says 1.8m). Of course Nadine chose the deepest part to chuck her float and sink in. The girl has no fear of water. Good thing both can swim a little better now. 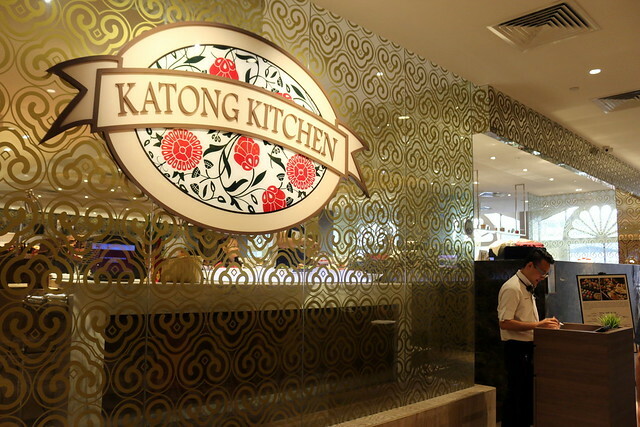 Back at the hotel, there's the all-day dining restaurant Katong Kitchen, which also happens to be halal. This is where you can have your buffet breakfast, lunch and dinner. We had breakfast here the next day. It's a decent selection of Western and Asian items, with a live station for eggs. My favourite item there is the nasi lemak with achar and otah. The rice is fragrantly fluffy and rich. 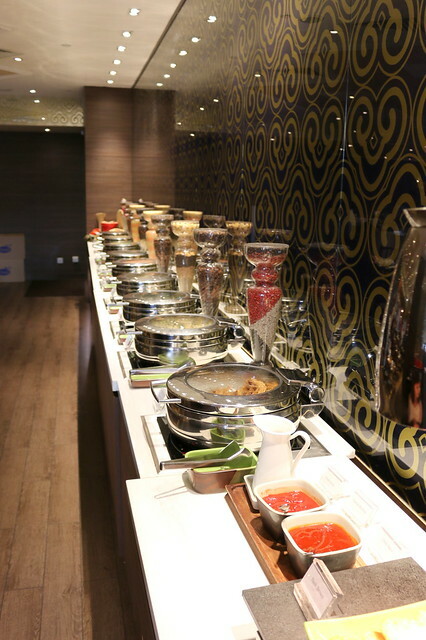 A lighter choice would be the Chinese-style porridge with condiments, braised peanuts, salted egg, century egg, pickles and chicken floss. Jolie liked the carrot cake. 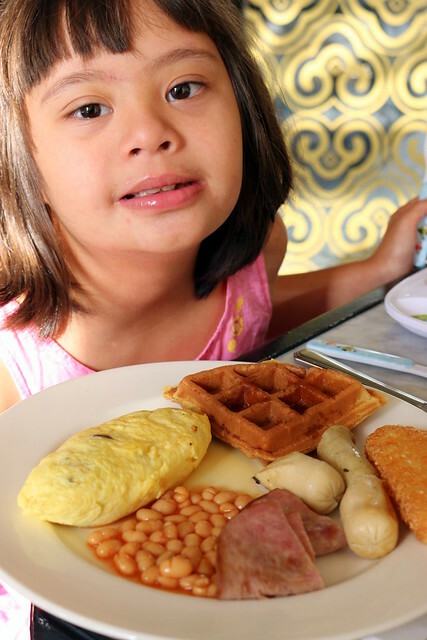 You could also have breakfast upstairs at the Peranakan Lounge. However, children are not allowed here at all times. That means peace and quiet for some, but families will have to head elsewhere. 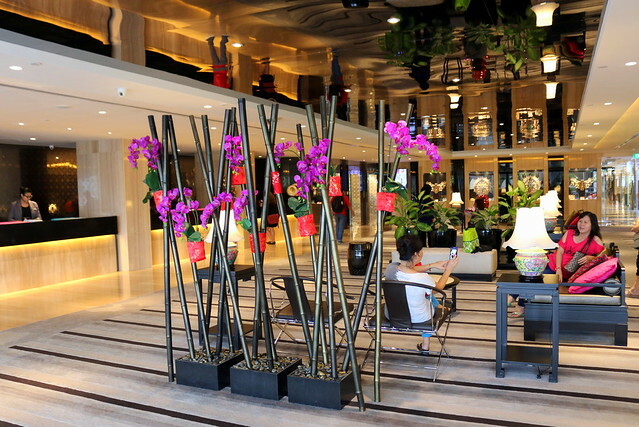 The hotel extends right into a shopping mall, Katong V, formerly the Paramount Shopping Centre. Group Therapy Cafe is there, with all day breakfast and great coffee. There's Tomi Sushi if you feel like some Japanese. 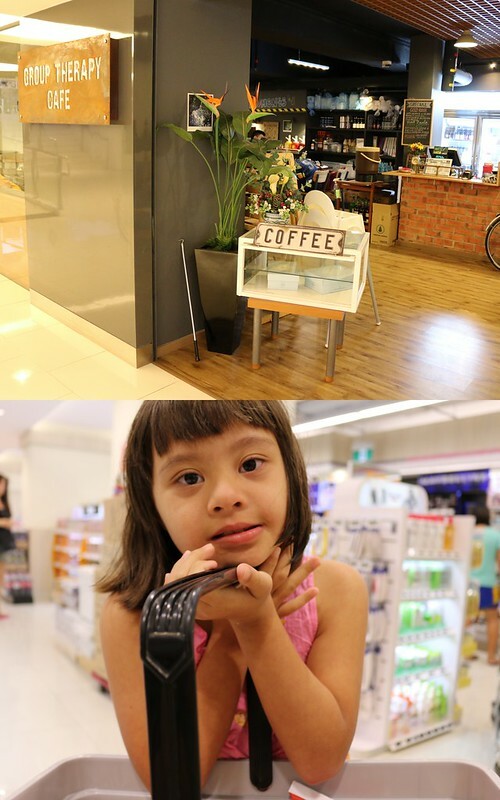 A small but well-stocked NTUC Fairprice Finest supermarket ensures you won't run out of basic toiletries or snacks. The girls always have a fabulous time on staycation. The Village Hotel brand is a locally grown one that aims to give their guests immersive experiences in the areas they are in. For overseas visitors, it gives them a chance to soak in the local way of life. Each hotel is different; this Katong hotel is their flagship hotel, and it is as cosy and warm as the Peranakan culture it's inspired by.